Support the project while taking advantage of these EXCLUSIVE, one-of-a-kind perks (original portrait paintings of each ‘backer’ WITH INCLUSION of portrait painting IN THE FILM, original drawings, empty viles of Vincent’s blood, paintbrushes used to created many of Vincent’s best known works, etc), offered for the 1st time, ONLY through this campaign. 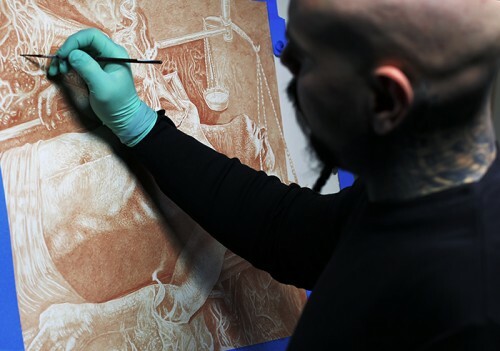 Bloodlines: The Art and Life of Vincent Castiglia is a feature documentary film produced and directed by award-winning filmmaker John Borowski. 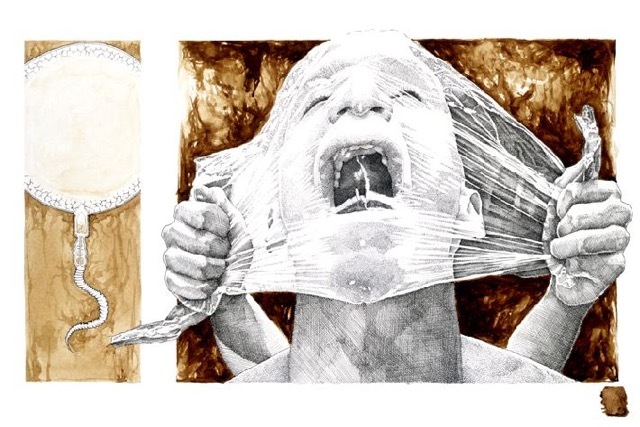 The film focuses on artist Vincent Castiglia’s inspirations and personal experiences. His work is singularly unique. For over a decade, he has painted exclusively in his own blood. Recently, there have been many requests for his highly specialized paintings to be created for his collectors using their blood, so he has begun working on select projects (chronicled in the film). The film also examines Vincent’s troubled past and his overcoming the odds to become a world-renown, critically acclaimed artist. He has had the distinction of receiving his 1st solo exhibition by personal invitation from the late master, H.R. Giger. The exhibition hung for 6 months in the Giger Museum Gallery in Switzerland. Featured in the film, for the first time ever, is the in-depth process by which Vincent creates his artwork painted in human blood. Interviews with a wide range of collectors who own his work will also be featured. The funding being sought for the production of the film includes in-person interviews with collectors of Vincent’s work across the US and throughout Europe. The funding will also be going toward several trips to New York City to interview Vincent in his studio, as well as post-production costs and perk-fullfilment costs. 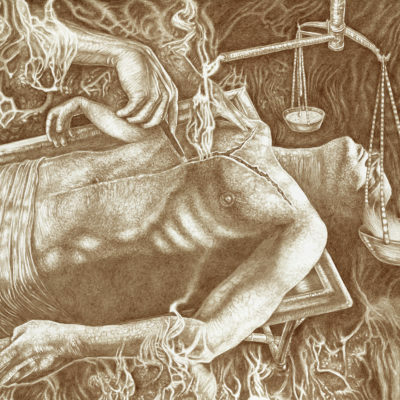 The project came about when Vincent Castiglia posted an online survey asking for feedback regarding whether or not a reality show on his work was of interest to his followers, to which John Borowski replied: “You deserve better than a reality show that is sensational for a short time period but forgotten in the long run. You deserve a feature documentary film highlighting your life and the reasons behind why you create your art. A film will stand the test of time.” Being very familiar with Borowski’s work, he entrusted John to create a film about his life and works of art. For the film’s musical score, Borowski looks forward to working again with longtime collaborator DC McAuliffe, who has scored four other films by Borowski. Visually arresting and creatively daring, this documentary captures the life and times of a truly rare American artist who utilizes his own life blood to create surreal works of art. We look forward to your contributions and hope to make this project a reality. Every film project has it’s own unique challenges and this film is no different. The goal is to continue production in 2015 and complete the film in 2016. Filmmaker Borowski edits his films organically over time and believes the film is completed only when all of the story is complete and every element is in it’s properly edited place for maximum visual and storytelling effect.